The FBI's 2017 Internet Crime Report puts Maryland in the top 15 states for victims of online crime and dollars lost. According to the report, Maryland was 14th in number of victims per state with nearly 7,000 victims and 15th for financial loss. Marylanders lost more than $30 million to scammers last year. 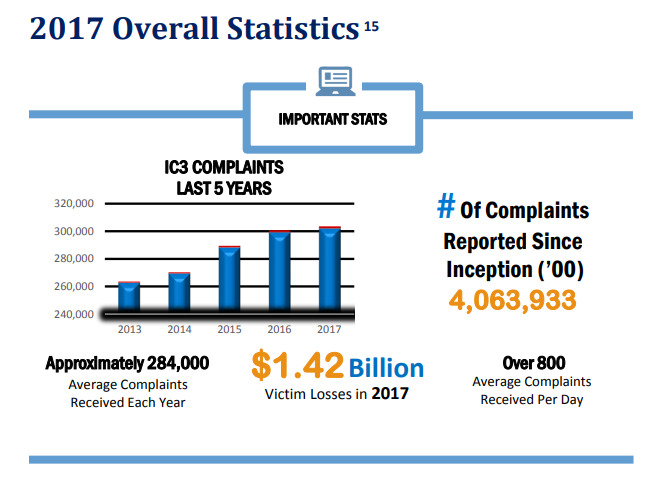 In total, Americans lost $1.4 billion to cyber crimes and the Internet Crime Complaint Center (IC3) received more then 301,000 complaints. The annual report is a snapshot of the most prevalent scams. Right now, the agency is seeing an increase in business email compromise. Scammers find a window into the system then send emails, sometimes from the accounts of the CEO of a business, requesting fraudulent wire transfers. “It’s the people who are tricked into compromising their accounts and once they have access to one individual, they essentially have access to an entire company,” said Nickolas Savage, Cyber Assistant Special Agent in Charge, with the FBI Baltimore Division. Ransomware holds victim's information or data hostage until the person pays a fee and tech support scams have become so sophisticated that victims don't think twice about the person on the phone claiming to be a customer service representative. “I literally spoke to someone no less than an hour ago that had an issue with a particular company that they were receiving. Again, it was a scam but it appeared so legitimate that unless you were skeptical, you really wouldn't know,” said Savage. And he said that the I-95 corridor is being bombarded by these online criminals. “Higher concentration of businesses, government agencies, it’s a rich targeted environment,” said Savage. Skepticism will help you avoid becoming a victim, but when you become the target, the FBI wants to know about it. Last October, the IC3 received its 4 millionth complaint but that figure doesn't scratch the surface of online deceit. Investigations do take time but Savage reiterated that the FBI takes these crimes seriously. Just last year, they played a key role in the prosecution of a Laurel man . He was sentenced to 19 years in prison for defrauding victims of millions of dollars through an online dating scam. If you’d like to file a complaint with the IC3, click here .